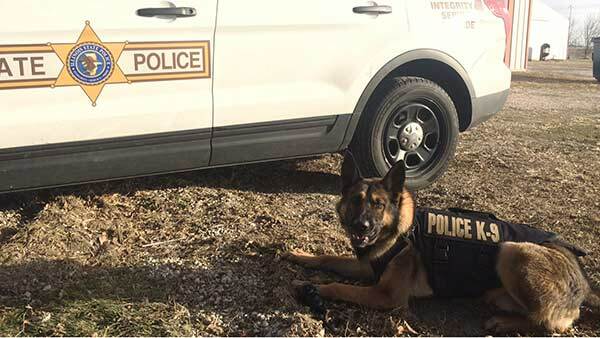 LOCKPORT, Ill. (WLS) -- An Illinois State Police District 5 K-9 officer named Chief will be much safer during his patrols now. Chief received a bullet- and stab-protective vest, thanks to a charitable donation from non-profit organization Vested Interest in K9s, Inc.
Chief's vest is sponsored by the Protecting K9 Heroes Fundraiser hosted by Staci Goveia of Lynwood, IL and embroidered with the sentiment "In memory of K9 Jethro, Canton, OH - EOW 1/10/2016". Trooper James Kirr and his dog Chief have been partners in the Illinois State Police for a little over two years and currently patrol Will, Grundy and Kendall counties. Trooper Kirr and Chief completed a ten-week certification course in Springfield and graduated in May of 2015. Chief is a dual purpose dog and is trained in narcotics detection, article searches, tracking and apprehensions. Chief is a 3-year-old German Shepherd/Belgium Malinois mix and loves going to work with Dad each day. Vested Interest in K9s, Inc. is a 501c (3) charity located in East Taunton, Mass., whose mission is to provide bullet- and stab-protective vests and other assistance to dogs of law enforcement and related agencies throughout the United States.